Ernie and his side-kick Maud (a sheep) are superheros in training, and this is the fourth instalment in their adventures. Each works well as a stand-alone title too. The Baxter Branch of the Superheroes Society wants to win the ‘Heroes of the Year’ competition, and add a lovely bright trophy to their collection. Of one. The trophy is awarded to the best trainee superhero for the year, judged secretly. But the Branch is torn: do they try to discover when the judges will be in town, or do they try to find who is drawing moustaches on photos all around the town. Ernie is dazzled by the trophy and Maud is keen to master the splits. They will have to concentrate their energies if they are to catch the moustache-drawer and win the competition. This is a delightful series for middle-primary readers. It would work well also as a read-to adventure. Extraordinary Ernie, with the help of the gymnastic-honed Marvellous Maud can do anything. All they need to do is believe in themselves. They rely on the advice of flawed superhero adults who seem to do very little in the superhero department. But Ernie and Maud are gradually winning the confidence of the street traders and other members of the general public. And when people believe in you, it’s easier to rise to their expectations and achieve. That aside, it’s hilarious. Recommended for mid-primary readers and anyone who ever wanted to be a superhero (or who still does). Ernie quaked inside. Not come back to the Superheros Society? Being a superhero was the most important thing in the world to him! Extraordinary Ernie loves being a superhero, and has even got used to having a sidekick who is a sheep. But now, only months into his training, he has struck a problem. Maud, his sidekick, has become moody and grumpy, and obsessed with her problems as the middle sheep in her family. It seems to Ernie that she doesn’t have time to be his sidekick any more. Now Valiant Vera says that if the pair can’t sort out their problems, then they’ll be kicked out of the Superheroes Society. The Middle Sheep is the humorous sequel to Extraordinary Ernie & Marvellous Maud and just as much fun as the first offering. The humour of having a sheep for a sidekick, and the cast of characters, along with the appeal of having a fairly normal boy becoming a superhero, is sure to tickle the funny bones of junior primary aged readers. The small format size and the short length add to the appeal. Ernie Eggers hurried along High Street on Thursday afternoon, his bright green cape billowing behind him. When he heard the clock on Baxter town hall strike four, he gave a sigh of relief. Phew! He’d been worried that he’d be late. Further up the street, he could see his sidekick, Maud, already waiting outside number 32, the headquarters of the Superheroes Society (Baxter Branch). There is to be a National Superheroes Conference and all the members of the Baxter Branch of the Superheroes Society are going. Ernie and Maud are particularly excited as this will be their first conference. The conference is all they expect and more, full of glittering superheroes and their fascinating sidekicks. It’s all so glamourous that Maud begins to feel a little insignificant. Then the conference is invaded by a very large chicken, who steals speakers notes and generally terrorises the gathering. Add a television super superhero and a bright red balloon and maybe it will Ernie and Maud’s chance to shine. The Greatest Sheep in History is the third instalment in the series featuring these fledgling superheroes. Each title blends reality and imagination in a giggle-full adventure. Ernie and Maud are superheroes blessed with innocence and bravery in equal measures. They breathe fresh life into the slightly-jaded world of the Baxter Branch of the Superhero Society. The adventure is told in third person, from Ernie’s perspective. Ernie’s narration allows the reader to experience his world but also sometimes to see beyond his interpretation. Ernie and Maud are friendly and accessible heroes and demonstrate that sometimes bravery comes from the most unexpected actions. Very funny. Judy Watson’s black and white illustrations enhance and extend almost every opening. Recommended for middle primary readers. Ernie Eggers was late for school. And it was all the fault of The Daring Dynamo. Ernie was a big fan of The Daring Dynamo, who was everything a superhero should be – and everything that Ernie wasn’t. The Dynamo was daring, obviously. And dashing. He was brave and strong. He never tripped over his own feet. He was never tongue-tied. His ears didn’t stick out. And, Ernie guessed, The Daring Dynamo was probably punctual. Ernie’s favourite television program was about a superhero, but he never dreamed he’d have a chance to become one himself. So when the local branch of the Superheroes Society advertises a competition with a prize of a side-kick, Ernie decides this could be his big chance. His interview at (Baxter Branch) Superheroes Headquarters doesn’t go well, but in the absence of other entrants, Ernie wins the prize – a superhero sidekick call Maud. Maud is a sheep. Ernie is underwhelmed, but Maud soon convinces Ernie that there’s more to her than a woolly coat and four legs. Extraordinary Ernie & Marvellous Maud is the first in a new series from ABC Books. So there’s some scene setting to do and some introductions to make. Ernie is transformed from an ordinary, average-scholar, often-late, non-sporty boy into Extraordinary Ernie, who with the help of the unlikely Maud is learning what it takes to be a superhero. The remaining members of the local branch of the Superheroes Society seem to have lost their oomph. There are hints that Ernie and Maud may just shake them out of the rut they seem to be in. Ernie is an appealing character and Maud an engaging sidekick. Both have strengths and weaknesses which seem to bring out the best in each other. There is clear indication here too of the value of believing in yourself. Extraordinary Ernie & Marvellous Maud is also very funny, full of absurdity and nonsense. 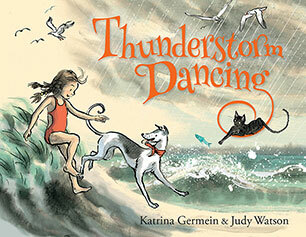 Judy Watson’s illustrations appear in most openings, breaking up the text for younger readers. There is plenty to entertain proficient readers. Highly recommended for early middle-primary readers and beyond. Counting is an integral part of our lives. And most young children learn about counting and numbers quite naturally before starting school. Counting books which encourage children to work out and augment numbers not only increases children’s capabilities in maths, but also help with numeric confidence, and are lots of fun. How Many Peas in a Pod is a cute counting book which features lovely ink and watercolour illustrations full of humorous detail, and nice big flaps for children to lift. The book asks children to count familiar and alliterative scenes like cows in a cornfield, socks in a suitcase, or bugs in a box, lifting the flap to find the answer. The numbers move from one to twelve, and finish with a kind of funny “too many to count,” that will get children laughing every time. The repetition of sounds will also help with reading and general linguistic skills, and there lots of funny things for young children to point out. The ladybugs ballet looks rather less graceful than one might expect, the dancing jellybeans have big smiles on their face, the pumpkins have silly faces, and the lazy lizards are true loungers. If your children are anything like mine, they may well try to count the flowers in the field. The soft but rich pastel shades used by illustrator Judy Watson also allow for colour games (“what colour is the duckie?”), and will spark young children’s imagination. This hardcover book is nicely presented enough to make a good gift. The fold over flaps are large enough so they won’t get broken off the way pasted-on ones will, and will encourage young children to participate in the story telling process. There are many counting, lift-the-flap book son the market, but this one is particularly funny, and with its linguistic alliteration, its big flaps, and its surprise ending.